Medicare Part D is the prescription coverage when someone enters Medicare. The Part D is sold by private insurance companies and varies in several aspects. 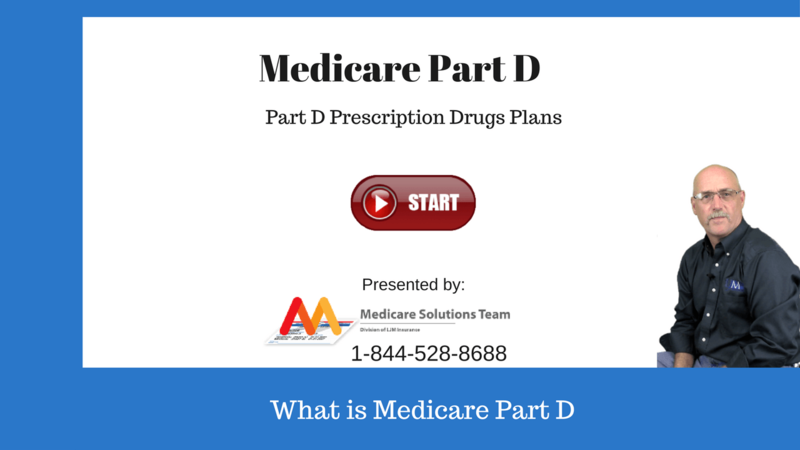 The Medicare Part D has several moving parts, keep reading for a complete explanation or call 844-528-8688. For seniors that are new to Original Medicare, it’s certainly understandable that you may have a lot of questions about coverage and cost. Medicare is a giant insurance plan and there is a huge amount of information out there about Part A (hospital coverage), Part B (outpatient and doctor coverage), and Part D prescription drug coverage. In an attempt to simplify things and take the confusion out of coverage questions, we are providing a list of "Frequently Asked Questions" to help our readers better understand Part D and all of the various components that are associated with it. No Medicare Supplement plan includes Part D coverage, but some Medicare Advantage Plans do, these are called MAPD's "Medicare Advantage Part D". There are designated times during the year when you can enroll in a plan, disenroll from a plan, or make changes to your prescription drug coverage. During the Initial Enrollment Period (IEP). For most applicants, the IEP commences three months before your 65th birthday (including the month of your birthday) and then ends three months after your birthday. During the Annual Election Period (AEP). If you miss the Initial Enrollment Period, you can enroll in Part D during the AEP. This period lasts from October 15th to December 7th each year. Also, you can make changes to your Part D plan during the AEP that will become effective the following year. What is the Special Election Period? There is also a Special Election Period called the 5-Star Special Election Period. Insurers that provide Part D prescription drug coverage are rated on a scale of 1 to 5 for quality and service with a 5 rating considered excellent. If your plan does not have a 5-Star rating or the company has been downgraded from a 5-Star rating, you can change your provider once per year between December the 8th and November the 30th. For most people the a Medicare Part D plan will have a few parts, keep in mind that plans vary county to county and if you are low income your costs will be very different. Below are the most common pieces of a standard prescription drug plan. What about the Part D Deductibles? Understanding your deductible is important because your Part D Drug Plan will not cover your prescription drug costs until you have met your deductible. There are deductible limits that are set by Medicare that the insurers must follow. For 2018, the highest deductible allowed is $405 for the year. This means that Part D plans can charge deductibles from zero to $405. Certainly, the better deal will be a plan with a zero deductible as long as the monthly premium is affordable. Most Part D providers have a coverage gap where the insurer stops paying for your prescription drugs. This gap is referred to as the Donut Hole. This can be confusing because the “donut hole” which is the Part D coverage gap is the period between your Part D initial coverage limit and when catastrophic coverage begins. During this period you will be paying a greater portion of your prescription drug costs. Fred Smith has enrolled in a Part D Prescription Drug Plan with XYZ Insurance Company and has a $405 deductible in 2018. Fred pays for the total cost of his prescription drugs until he reaches the $405 deductible. 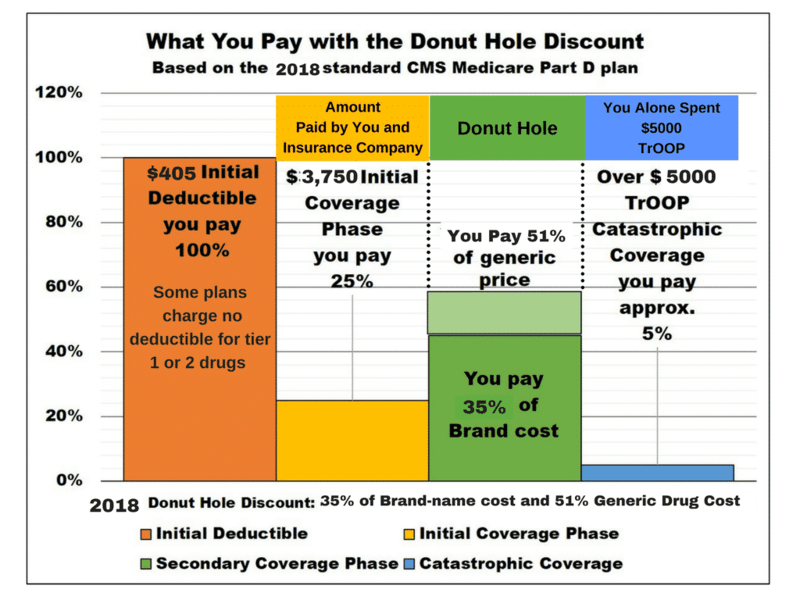 When Fred and the insurer have spent $3,750 in 2018 for medications, he enters into the coverage gap (donut hole). Now Fred must pay 35% of his plan's price for covered brand-name drugs and 44% of the plan's price for covered generic drugs. What Fred pays for drugs along with the discount paid by the drug company counts as out-of-pocket spending and is what will help Fred exit the coverage gap. Once Fred’s out-of-pocket expenses total $5,000 in 2018, his coverage gap ends and he begins to pay a small copayment (or coinsurance) for all his prescription drugs for the balance of the year. If Fred had qualified for Medicare Extra Help, he would not have had to spend near as much out-of-pocket during the coverage gap. These can vary a little from plan to plan, for instance, atorvastatin could be a tier 1 with company A and a tier 2 with company B. Generic drugs can fall in any of the tiers. If you are confused by the details of the Medicare Part D, you are not alone. We are here for you, if you need answers or want quotes, just call 844-528-8688 or send us an email from our contact us page.